The Daily Star Spelling Bee is moving onto the TV rounds - a main event of sorts of the competition. The competition is expected to peak with the 72 best spellers coming through from all over the country to participate here. But what the top 72 did not have in mind is the roadblocks and challenges that lie ahead in the TV round with the format being drastically changed from the conventional Spelling Bee style. Instead of spelling the words out loud with clues such as meanings, part of speech and use in a sentence, the competitors will have to spell out different words with a given set of letters - just one of the challenges in the TV rounds, which seems to have been derived from the Indian version of the Spelling Bee. It involves more thinking and feels more like a reality game show with a points system. Ikram Mohammed Sohail, a class IX student from Sunbeams is however of the opinion that the new format will lead to “point abuse”. “I can't get negative marks for getting the answers wrong, so even if I don't know the answer I'll make sure I'm first to press the buzzer so that other don't get the points,” he says. Ikram clearly has a point but this same strategy might be applied by his counterparts which eventually cannot lead to a higher standard of competition. However the most interesting comments came from Raiyan Ishrak Ahsan, a class VIII student from Manarat International School. He thinks that all the “big and difficult” words that he recently memorised in preparation for the TV round have all gone to “waste”. “I have to start over with my preparation. I wish they stuck to the current format because this is the traditional format. But I guess they also have to keep in mind what the viewers will like and they will probably find this format more entertaining,” he adds. Raiyan's comments, although short, spoke volumes as to how difficult it has already been for students with the rigorous curriculum that they have as far as their studies are concerned. And then to try out for the Spelling Bee, work hard, make it so far and then to find out that the whole system has been changed; the students have every right to feel slighted. But in the end, the fact that they will be part of a TV program, along with getting the opportunity to win big money and the recognition of 16 crore people, is all the motivation they need to keep giving it their best. One can only hope that eventually this will lead to the best Spelling Bee possible. After a successful show, “Return of the ABC Generation”, last year, Live Square Concerts brought us a follow-up on 6th April, 2012, held at the Institute of Engineers Bangladesh. 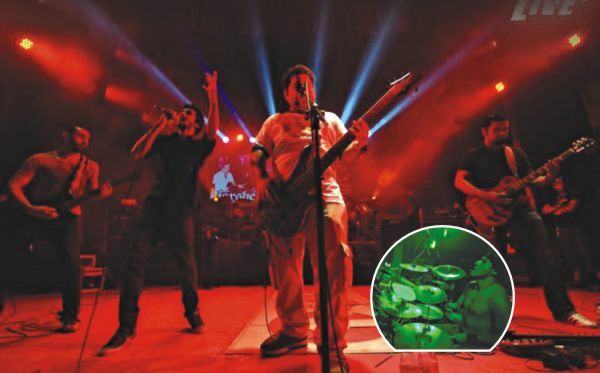 The explosive music returned with three of the biggest bands in Bangladesh, all under one roof and on the same stage: Artcell, Black and Cryptic Fate. Black took to the stage first, as Tony dispelled the numerous theories floating around about who the new frontman for Black was (in the absence of Jon, who is currently on a break from music). After the first song, the legendary “Blues and Roud” with Tony and the crowd on vocals, the vocal for the rest of Black's show was revealed: Mishuk, who has had some experience in the music scene, but nothing as big as performing with Black at one of the biggest concerts of the year. Black put on quite a show, with the crowd providing a good deal of support for the young vocalist. The presence of Jon was not really missed, but we hope he comes back to the band, as Black isn't really itself without the enigmatic frontman. But Jahan, Titu, Tony and Mishuk put up quite a memorable performance without him. Second on stage was Cryptic Fate, with Shakib assuring the crowd there would be no shortage of Fate's lengthy songs. They lived up to the promise, with tracks like “Ognibina” and “Danob” being performed. The performance of “Raag” was specially a crowd pleaser, with Nazrul bhai on dhol receiving a great welcome to the stage, for the song's now famous dhol part. Farshed on drums was absolutely brilliant, providing a thundering intro to “Danob” while the lights were off. In the pitch black darkness, the double bass set hearts thumping and ready for Shakib's vocal attack. Sarfaraz and Farhan's performance on guitars were brilliant all throughout. The band had a surprise for the crowd, as Nemesis vocal Zohad joined Cryptic Fate on stage. They performed Nemesis' “Kobe”, a song that has gained legendary status in an extremely short period of time. A good note for Cryptic Fate fans, their next album “Jantrik Golojog” will be out soon, so definitely watch out for that. The gods of metal in Bangladesh, Artcell, took to the stage last. Artcell's drummer Shaju, on a break from the band, came back from Australia to perform at the show and work on the next album, which Cezzane said would be coming out by next Eid. They performed classic Artcell numbers like “Dukhho Bilash”, “Chile Kothar Shepai”, and “Ghune Khawa Roud”. Compared to Artcell's usual energetic performances on stage, this year's ABC concert saw a slightly deflated Artcell doing a minimum of songs for the hungry crowd. We hope the lack of energy is from working hard on their next studio album, which should be epic in every form. After individual performances were over the key members from each band took to the stage and performed Metallica's Enter Sandman and Iron Maiden's The Trooper. They also performed the song Ashirbad which was composed as a tribute song to the ABC generation. The crowd was a bit sparse compared to last year, but the returning concert attendees were treated to a great show, as good as last year's, if not better. Live Square concerts, now promoting the Power of Good Music (the tagline for this year's free concert merchandise), is doing a great job keeping Bangladesh's concert music going in the right direction, and we can't wait to see what they come up with next. ABC 2013 should be a definitely maybe at the least.